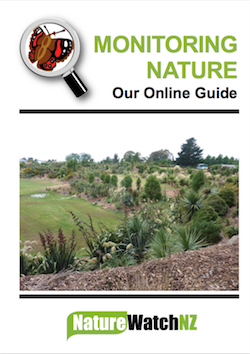 In 2015 we ran a series of workshops for community restoration groups on how to monitor nature using iNaturalist NZ — Mātaki Taiao (previously NatureWatch NZ). These workshops were funded by the Department of Conservation Community Fund (thanks DOC!). For these workshops the New Zealand Bio-Recording Network trust prepared an extensive how-to guide. This was written by members of the trust and edited and designed by Davena Watkin. You can download the complete guide here (4.7 MB PDF file).